I’ve wanted a feature in Evolution for a while. It was formally requested in 2002, and it just recently got fixed in git master. I only started publicly groaning about this missing feature in 2013, and mcrha finally patched it. I tested the feature and found a small bug, mcrha patched that too, and I finally re-tested it. Now I’m blogging about this process so that you can get involved too! I’d like to be able to select a bunch of messages and click an archive action to move them to a specific folder. Gmail popularized this idea in 2004, two years after it was proposed for Evolution. It has finally landed. This will let you have a different folder set per account. If you use Evolution with a Gmail account, and you want the same functionality as the Gmail archive button, you can accomplish this by setting the Evolution archive folder to point to the Gmail “All Mail” folder, which will cause the Evolution archive action to behave as Gmail’s does. This is also available via the “Message” menu. You can also activate with the Control-Alt-a shortcut. For more information, please read the description from mcrha. Once the feature was patched in git master, I wanted to try it out right away! 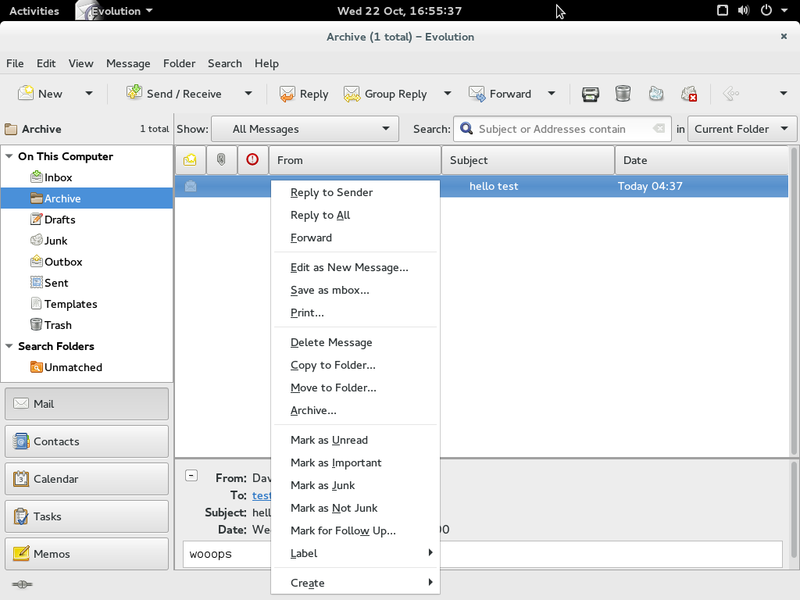 The easiest way for me to do this, was to use the GNOME Continuous project that walters started. This GNOME project automatically kicks off integration builds of multiple git master trees for the most common GNOME applications. If you follow the Gnome Continuous instructions, it is fairly easy to download an image, and then import it with virt-manager or boxes. Once it had booted up, I logged into the machine, and was able to test Evolution’s git master. If you want to tweak the app for debugging purposes, it is quite easy to do this with GTKInspector. Launch it with Control-Shift-i or Control-Shift-d, and you’ll soon be poking around the app’s internals. You can change the properties you want in real-time, and then you’ll know which corresponding changes in the upstream source are necessary. I did find one small bug with the Evolution patches. I’m glad I found it now, instead of having to wait six months for a new Fedora version. The maintainer fixed it quickly, and all that was left to do was to re-test the new git master. To do this, I updated my GNOME Continuous image. 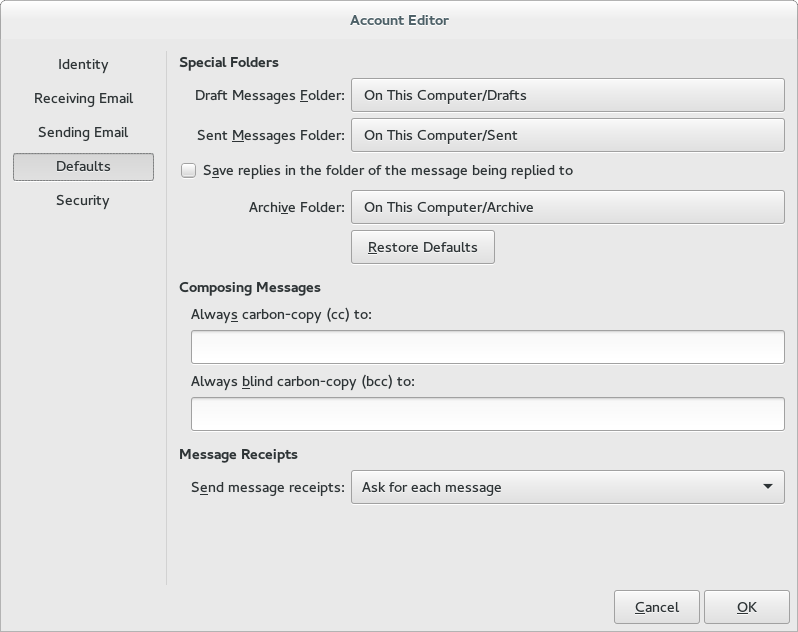 Click on Control-Alt-F2 from the virt-manager “Send Key” menu. Set the password to something by running the passwd command. Click on Control-Alt-F1 to return to your GNOME session. Open a terminal and run: pkexec bash. Once it has finished downloading the updates, reboot the vm. You’ll now be able to test the newest git master. Please note that it takes a bit of time for it to build, so it is not instant, but it’s pretty quick. I took a few screenshots from inside the VM to show to you in this blog post. Extracting them was a bit trickier because I couldn’t get SSHD running. To do so, I installed the guestfs browser on my host OS. It was very straight forward to use it to read the VM image, browse to the ~/Pictures/ directory, and then download the images to my host. Thanks rwmjones! Hopefully this will motivate you to contribute to GNOME early and often! There are lots of great tools available, and lots of applications that need some love. This entry was posted in technical and tagged archive, continuous, devops, email, evolution, fedora, geary, git, gmail, gnome, gnome continuous, gpg, gtkinspector, guestfs-browser, libguestfs, planetdevops, planetfedora, planetpuppet, virt-manager by purpleidea. Bookmark the permalink. Can you please link me to the bug on this issue? This is nearly 2 years ago but this feature still hasn’t made it in to the Ubuntu repos? Ubuntu (and Debian stable) move slowly. If you want something fresh try Arch or Fedora. Interesting, seems a bit drastic to switch distros though. Lack of this feature is a deal-breaker for Evolution though because who doesn’t use either Gmail or Google Apps and for those you really need the archive feature. I’m sure there’s a way to get this version on Ubuntu by passing the version number to apt-get or similar?